The Plaza Waterfall Bath Taps with Slider Rail Kit; the perfect modern fixture for any bathroom. The tap features a open spout which create a stunning waterfall effect. 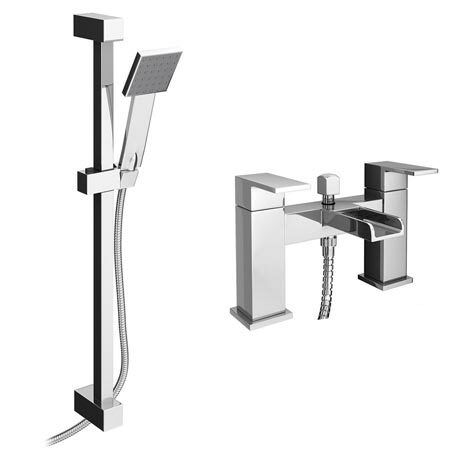 The Plaza Waterfall Bath Shower Mixer Taps come with a easy clean square handheld shower head, slide rail and flexible hose. Please note - Certain parts on the slide rail kit are chrome plated plastic, not metal. The only parts that are not plastic are the shower valve, rail and the hose. Well built really good and nice looking. "The mixer provides enough power for the slider rail shower head which I was impressed with. This products provides two shower heads and two chrome hoses. The rail is plastic which I have some concerns about but for the price its a nice looking, and the slider rail makes it look great." I've already told a couple of friends about the high quality and reasonable prices of your products. "All the items in the whole bathroom suite that we bought were excellent, easy to install. The customer service was excellent I ordered an incorrect item which I realised before delivery this was changed and all items received were correct. I was contacted to tell me about the delivery and on the day of delivery I was contacted to advise me time of delivery." A good buy but the shower head is impractical is you shower regularly. Great mixer tap with the added benefit of a shower slider rail. Very contemporary and stylish. Very happy with my purchase. Very nice and stylish we really like it. Very happy just what I wanted & at a good price too. Easy to fit but not yet fully tested.